We provide a professional, independent MOT testing service for private and commercial vehicle owners at our modern testing facility in Yate. We offer an independent and transparent service and because we do not carry out repairs, you can be sure of an objective test with unbiased results. 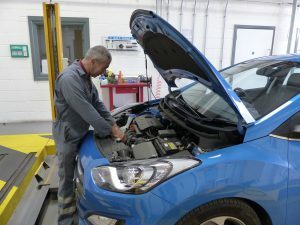 We have a team of experienced mechanics who will carry out a purely objective inspection of the vehicles being tested. They are always willing to help customers with particular needs or requirements and are happy to provide advice on your vehicle. The MOT test takes around 1 hour. Customers can wait in our comfortable waiting area and watch their vehicles being tested, there is also a hot drinks machine. Free Wi-Fi is available. A café serving hot and cold drinks and food is located on site and is open to the public. It is the owners’ responsibility to ensure the repairs are carried out and a re-test is booked. We do not charge for re-tests providing the original test was taken within our workshop and the vehicle is returned within 10 working days. MOT re-tests take approximately 30 minutes. We offer a free SMS text reminder service to alert you when your MOT is due. Our Transport Assistants will be happy to set this service up for you. We test all types of vehicles including motorhomes, camper vans and buses. Motorhomes, large buses and horse boxes can be accommodated by prior arrangement. Please be aware that customers often have problems when following a SatNav due to a dead-end on Broad Lane. Turn off the B4050 (Iron Acton Way / Goose Green Way) at the Fox Inn onto North Road (signed to Council Offices). Turn immediately right onto Broad Lane, continue approximately 200m and the Depot Entrance is on your left hand side just before the dead-end barriers. Our customers really value the trusted and reliable service we offer and have rated our MOT centre as Excellent.